NOTE: In the world of The Big-O, the "R." is a title applicable to androids that interact with other people. Roger Smith was first introduced to Dorothy when asked by a leading scientist to negotiate the release of his kidnapped daughter...a negotiation that went awry in too many ways to count. For one thing, he learns that Dorothy is an android. For another, he learns that neither party is playing a clean game, and he finds himself having to untangle the mess...especially once Dorothy comes to him and asks him to protect her. After some searching and fighting, he figures out the truth. R. Dorothy Wayneright was created by Dr. Timothy Wayneright in the image of his daughter, who apparently was killed in the chaos of the Amnesia. Soldano had provided the funding so long as Dr. Wayneright also built a Megadeus...a Megadeus that was eventually stolen by a small-time crook named Jason Beck and was eventually destroyed by Roger...twice. In the process, both Soldano and Wayneright were killed, so Dorothy no longer had a place to call home. She decides to stay with Roger and become part of the household, a move which Roger understands but still resents at times. Dorothy may possess incredible physical capability, but her capacity for emotion appears limited, but she is an android whose secrets have yet to be totally revealed, and Roger learns of new surprises at every turn. Later in the series, a mysterious android assassin who looked like Dorothy went on a rampage against key Paradigm figures. 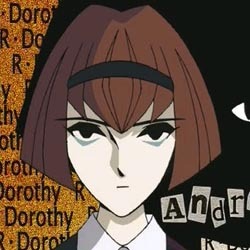 The fact that the android looked like Dorothy casts some interesting questions on the role of androids prior to the Amnesia and the exact source of the Memory Timothy Wayneright had that allowed him to create Dorothy.